Soluble fms-like tyrosine kinase 1 (sFlt-1), an alternatively spliced variant of the vascular endothelial growth factor receptor 1, induces a preeclampsia-like phenotype in experimental models and circulates at elevated levels in human preeclampsia. 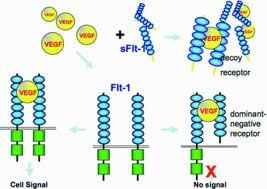 This is the factor that leads to decreased VEGF in pre eclampsia and causes the kidney related findings. Mice studies have shown that giving VEGF can alleviate the findings; but giving VEGF might pose significant risk to the fetus. Investigators at Harvard have shown for the first time that sFLT-1 can be removed via apheresis. Dextran sulfate apheresis lowered the levels of sFlt1 and reduced proteinuria, blood pressure and allowed for fetal growth in their observational paper. This pilot study is published in the August Circulation Issue and further testing is needed in a randomized fashion with more subjects to prove this will work.